Spoof news: President Bush to Appear on "Are You Smarter Than A Fifth Grader?" 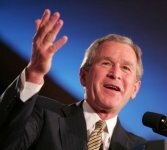 President Bush to Appear on "Are You Smarter Than A Fifth Grader?" Bush at the podium attempts to answer the questions from Jeff Foxworthy. Richard Nixon appeared on Laugh-In and said "sock it to me." Bill Clinton played the saxaphone for Johnny Carson. Now, George W. Bush has filmed an episode of "Are You Smarter Than A Fifth Grader?" The new Fox Network show is the highest rated new show in several years. Contestants answer questions from first through fifth grade textbooks for increasing amounts of money. They can be "saved" from elimination by a "class" of five ten year old children. If they are unsure of an answer, they can "peek" at another child's, or they can copy another child's. If they miss a question, they can be saved from elimination if the child had the question right. While the episode is scheduled to debut next week, this publication was able to obtain a transcript of parts of the show. Jeff Foxworthy: "Okay, folks, tonight we'd like to welcome as a contestant George W. Bush, the President of the United States. Normally I tell the folks at home what elementary school our challengers graduate from, but we were unable to locate that information on you, Mr. President. Did you graduate from elementary school?" Bush: "I don't accept responsibilitation for records that may have disappearated over time. This is just like that National Guard thing. You can ask anyone who went to school with me and they can assertate that I played an eggplant in the school play at graduation." Foxworthy: "Okay, Mr. President, your first question is on first grade history. Washington, Lincoln, and Jefferson are three of the Presidents on Mt. Rushmore. Who is the fourth?" Bush: "My daddy was the greatest president this country ever had. Because of him, we found a thousand points of light and stayed the course and freed Kuwait from Saddam. My answer is Daddy." Foxworthy: "Sorry Mr. President, but the correct answer was Teddy Roosevelt. You'd better hope that young Taylor here has the right answer and can save you." Bush: "Daddy wasn't there? We'll just have to fix that!" Foxworthy: "Okay, here is your second grade transportation question. A car's direction is controlled by a steering wheel. What do you call the thing that controls the direction of a Vietnam era fighter jet?" Bush: "Ooh, that's a hard one." Foxworthy: "Come on, Mr. President, we know that you flew these while you were actually reporting for your Texas National Guard duty during the Vietnam war." Bush: "Yes, but it's been so long I forgot. I'm going to have to copy Suzie's answer." Foxworthy: "Mr. President, you've now used up two of your cheats. Your next question is on second grade political science. The constitution guarantees all of the people certain priviledges in the first ten amendments. This protection to their lives is referred to as the Bill of what? Bush: "The people have protection and priveledges too? I thought it was just the rich and powerful like me or the smart guys. I'm going to have to peek at her answer." Foxworthy: "Okay, Alicia's answer is The Bill of rights." Bush: "No, she's wrong. We did our best to get rid of civil rights, and I've never heard of any bill of rights, at least not in my administration, so she's wrong. I think the answer is The Bill of blind obedience." Foxworthy: "I'm sorry, Mr. President, she had the correct answer. You'll have to leave us with nothing and you are not smarter than a fifth grader. In fact, you proved today you are not even smarter than a first grader!" Bush: "I am so! I'm smarter than you and I'm president and you just make stupid blueneck jokes and red collar comic stuff! And...and...and you're shows all got cancelled and you're just dumb and I'm gonna tell my mommie on you!" Foxworthy: "I rest my case."